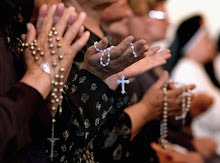 Rorate Caeli has today posted an article that includes some speculation that Archbishop Piero Marini may replace Cardinal Canizares Llovera as Prefect of the Congregation for Divine Worship and the Dicipline of the Sacaments. This is just one of several appointments about which rumours are circulating. See Rorate Caeli for all the details. Archbishop Piero Marini (not to be confused with Mgr Guido Marini, the current pontifical master of ceremonies) first came to prominence as the personal secretary to Annibale Bugnini. Later, he became pontifical master of ceremonies, a post that he held for most of the pontificate of John Paul II and the early years of Benedict XVI's pontificate. Benedict replaced him as MC by his namesake, Guido Marini, and appointed him (Piero) head of the commission for pontifical eucharistic congreses. This could hardly be called a promotion, and it seemed to many that Marini was not happy with the move. He spent some time writing a book which was critical of the liturgical reforms introduced by Pope Benedict and travelled the world publicising it. In this, he was assisted by Cardinal Cormac Murphy O'Connor, who arranged for the book to be launched in England from the throne room of Archbishop's House in Westminster. It must be emphasised that all we have at present is speculation, although there is some evidence to support some of the other appointments that are being talked about. However, the promotion of Archbishop Piero Marini to head the Congregationfor Divine Worship would be very controversial. Marini has been associated with an extreme liberal position on liturgical form for so long that it would seem difficult for him to exercise the balanced view that is required from someone occupying such a high position. Another reason why the appointment of Piero Marini would seem odd, is that he is already aged 71. He would be expected to tender his resignation in less than four years of his taking office. This is hardly enough time for anyone to develop a coherent strategy or make a personal impression, especially someone whose most productive years are over. Below is a poster sent to me by Fr Cahill concerning a Solemn Mass for the Feast of St Peter and St Paul. The Mass is at his church in Leicester. Fr Cahill has been a strong supporter of Latin Mases in the Middlesborough Diocese, taking a leading role at each of the three Margaret Clitherow Pilgrimages. Please support this Mass if you can. ﻿Unfortunately, I cannot get the poster to upload, but the Mass is at 11am on 29th June in the Church of St Peter in Hinkley Road, near the centre of Leicester. I was pleased to see that Edward Leigh MP has been knighted in the Queens Birthday Honours. He is now Sir Edward Leigh. As MP for Gainsborough for 30 years, Edward Leigh has always upheld the Catholic viewpoint in parliament. I cannot think of another MP currently in parliament with the same record. 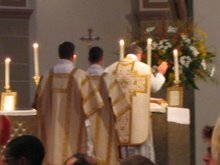 For those of you who weren't there, or would just like a reminder of the day - here's the video of the Mass.